This is an orange red…which normally would not be something I'd go anywhere near. But I got a color spoon, and while the base color is orange-red, there are pink duochrome tones that keep this from being a straight-up orange. The duochrome effect looks pink in some lights, and gold in other lights. The overall color is a very autumnal orange. 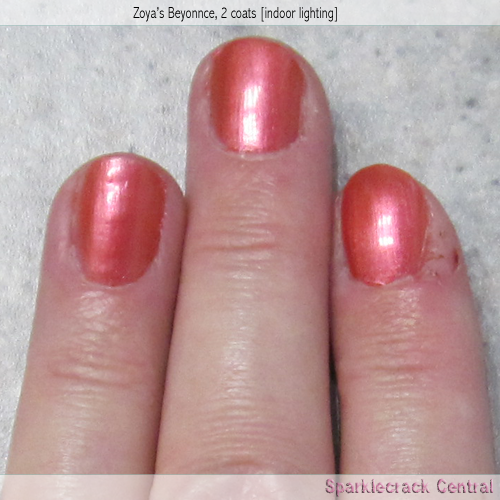 I got full opacity in two coats; but I knew that this was a “semisheer” (opacity 3, in Zoya's book) and so my two coats were a bit heavier to compensate. Application was very smooth, no slubbing or thin spots. Dry time was about average for Zoyas - fairly quick. I really, really, REALLY like this polish color. 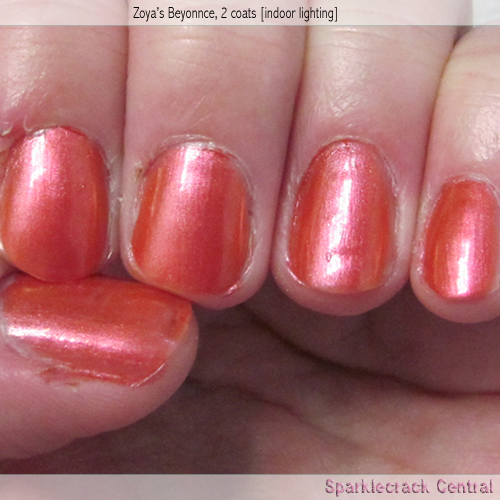 I may try and figure out if it's got an equivalent Zoya creme, for use in nail stamping. 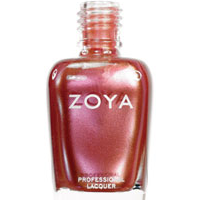 I think that this would also make a good layering polish over some of Zoya's darker (almost-black) colors like Nina or possibly even Norra. 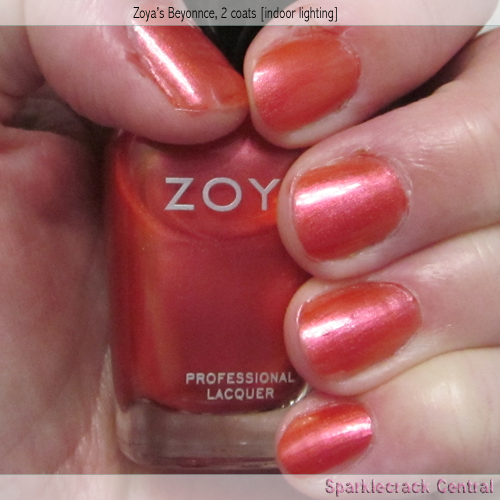 I like this polish, and recommend it to folks who have tried - unsuccessfully - to wear orange or rust-colored polishes. (My own coloring is fair with cool undertones, and I have an absolute pest of a time wearing bold oranges or even most neon colors.) This might just work well for you! !